In the past 500 years, the dance of technological advancement and church music has moved worship from a spectacle to participatory to a spectacle again. What will be the technology that brings it back? The image of church music has changed a lot over the years, mostly thanks to shifts in technology. Before the Reformation, people listened as cantors and professionals sang in Latin (a language they did not know) and the priest interpreted the words. Music was a spectacle as the people just listened. 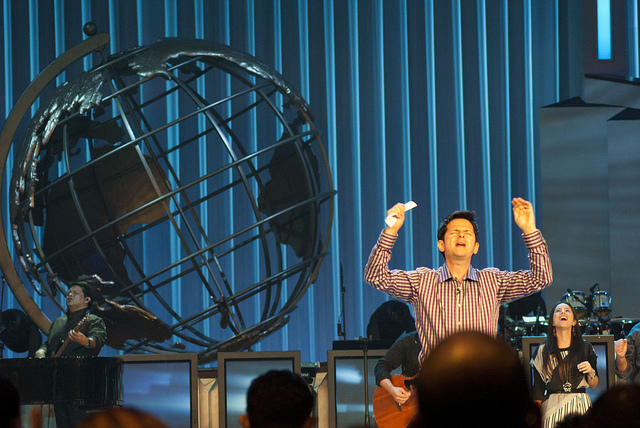 After the Reformation put the worship experience in the common language and the new technology of the Gutenberg printing press began churning out hymns in the people’s language, then participation in worship skyrocketed. Another shift came from the early Methodists. In the time of John and Charles Wesley, singing was a dignified thing done inside church walls in Pre-Revolutionary War England. From their field preaching and the way how they were criticized for being “rowdy” you know that meant they sung outside. These participatory hymns were highly important because they taught theology and Christian tenets to common folk who were mostly illiterate. There’s some areas that I likely missed–I’m not an informed music commentator. But it seems to me that in the span of a few hundred years, music in worship went from an observed spectacle to a full and essential participation in worship, thanks to a happy marriage between technology and hymnody. About 20 years ago a new technological advance – the computer controlled projection screen – entered America’s sanctuaries. Suddenly churches could project song lyrics for all to see. Hymnals became obsolete. No longer were Christians limited to 1,000 songs handed down by our elders. At first, churches simply projected the songs everyone knew – hymns and a few simple praise songs that had come out of the Jesus Movement. People sang robustly. But that began to change about ten years ago. 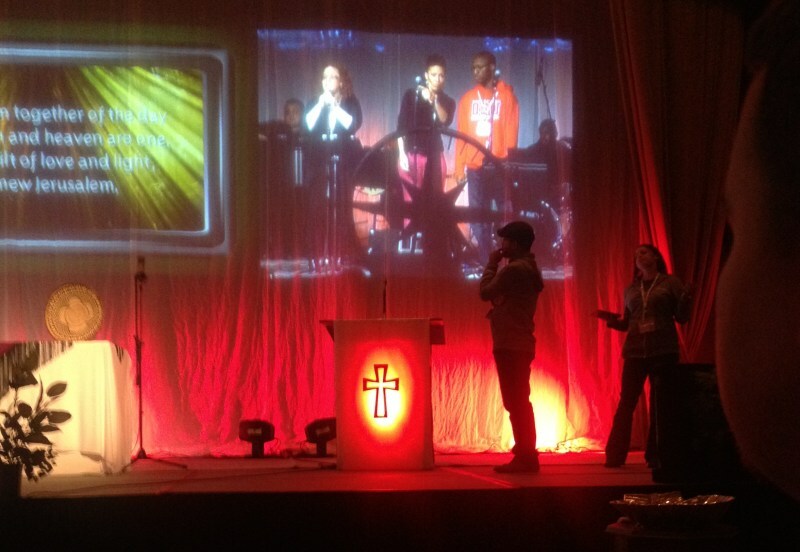 Worship leaders realized they could project anything on that screen. So they brought in new songs each week. They drew from the radio, the Internet, and Worship conferences. Some began composing their own songs, performing them during worship, and selling them on CD after church. In short order we went from 250 songs everyone knows to 250,000+ songs nobody knows…Songs get switched out so frequently that it’s impossible to learn them. People can’t sing songs they’ve never heard. And with no musical notes to follow, how is a person supposed to pick up the tune? And so the church has returned to the 14th century. Worshippers stand mute as professional-caliber musicians play complex instruments, sung in an obscure language. Martin Luther is turning over in his grave. The move from common-knowledge hymns to ever-shifting Top 40 Christian Contemporary songs (with less systematic theological teaching–with some exceptions) changed us back from participation to spectacle. The number of big band & worship leaders continue to rise as hymnals and church choirs are falling fast. This is not a commentary on the value of a particular style of worship (ie. worship wars circa 2002) but on the effects of shifts in worship music. I’d like to caution, though, that I do wonder if the technology or the music leadership choices is more to blame? Having the screens project the words causes people to face and sing forward (thus louder), rather than looking down to the hymnal and trying to read music. So is it the technology or the temptation to not use familiar hymns that is to blame for a downturn in congregational singing? I would argue the latter. Regardless, for those of us that value participatory hymnody, what is the solution? Music as Immersion or Accompaniment? As my own local church sees more young adults participating in worship, I actually think another technology is helping young adults find more draw to participatory hymnody: the Smartphone. Why? You carry your music with you, a soundtrack you are immersed in when you move. I occasionally listen to my Awesome 1990s Alternative mix as I walk and mass-transit from home to church. With the music seemingly coming behind me from my earbuds, I feel more immersed than I did in the actual 1990s with the big stereos. I sing along and pay more attention to the lyrics now–gosh, some of that music was terrible. The way I consume media on my smartphone now is not accompaniment but immersion. Likewise, the shift in worship must come–as Dan Wilt articulates here–away from seeing technology as accompaniment, as that which draws the focus outward. Technology rather becomes that which immerses us and draws us inward and upward. For some it is the thousands of pipes in an old well-cared-for pipe organ. For some it is wisely chosen images projected on a screen causing visual reflection for the sermon or the hymn. For some it is the architecture of a building with high walls, exposed-wood ceilings, or stained glass. For the best, it is a combination of all three (visual, audio, kinesthetic) in tasteful, intentional ways. Today, however, many of the Worship Immersion Culture ilk are excited to re-integrate a variety of more participatory worship experiences, from singing together, to experiencing beauty together, to weekly communion, to responsive prayers, to the passing of the peace, and much more. They don’t need the music to accomplish all things participatory in the conventional sense of the word. They can be surrounded by the music in one moment, and breaking the bread together with a few shared words in the next. In fact, the aesthetics of the building, the type of art adorning the building, the fellowship spaces (cafe areas, etc. ), and the missional spaces (food distribution areas, etc.) matter to them as much as the music. Buildings, for the Worship Immersion Culture, matter beyond their function. My claim is that the smartphone–its immersive ability when it comes to absorbing media, not its distracting features–actually helps mimic and draw out the immersive experience that describes the worship above. If our iPod generation is used to experiencing music in that way, it is actually better for traditional hymnody and worship experience, which does the same type of music experience in a deep architectural space. Many evangelical worship services are beginning to do the same thing: though we sometimes pick on Asbury UMC in Tulsa here at HX, their new worship setup is phenomenal. The way how we consume media has shifted significantly since the Napster days about 15 years ago: what can we learn from it for our worship experiences? While we can moan about how many bad choices and unwise uses of technology in churches have caused a decline in the use of choirs and hymnals, we can also embrace how media consumption habits (influenced by smartphones) can actually bring back an appreciation of the best aspects of hymnody and worship experience, encourage congregational singing (when it is paired with wise choices of music and implementation of technology), and embrace the best mix of presentational and participatory music in the worship experience. I’m excited for the next few decades as we seek to undo the damage done by uncritical use of technology and worship design. I believe it is possible by careful use of technology (and appropriation of media consumption habits) to move the pendulum back to congregational singing, immersive worship, and hymnody that teaches the head as much as it incites the heart. This is just a run-through of some thoughts on technology and worship I’ve been kicking around and I thought I would finally throw the spaghetti against the wall and see what sticks. I’m one of those worship leaders projecting words on the screens, and many from the CCLI top 100. However, I am very passionate about choosing songs that our community of faith knows, repeating new ones so that we can all can learn them, and continuing to encourage congregational participation by singing in worship. I view that as integral, and work hard to step away from the mic often so that the people of God may raise their voices together. I feel like your words and harsh criticism of contemporary worship exacerbate a misconception that’s common among denominational circles. Yes, there are leaders and times that contemporary worship turns into a spectator sport, and I’m not supportive of that. But there are also many faithful worship leaders that are passionate about God’s people singing together. And there are many faithful songwriters and arrangers working hard to add to the hugely diverse amount of music available for followers of Jesus to sing. And there are many young people, huge movements in fact, that are connecting to this new worship music, singing loudly, praising God through different instruments, and taking part in many ways of this awesome privilege and response that we call worship. Your words discount that, and I believe that the denominational church can learn a lot from the many good examples of worship and worshipers reaching younger believers in the Church. I am glad that you examine other ways to engage in worship such as communion, readings, prayer, etc. Those are all available on smartphones, and at our church we project those things on the screens as well. We encourage people in our community of faith to use Youversion, the free Bible app from Lifechurch.tv, and even encourage to look up passages on their smartphones during the service. I appreciate this conversation and think it is an important one. Thanks! Thanks for the “breezy survey” of the pendulum swings. It’s helpful to remember the swings actually have existed and have some substantial history behind them. 1) For early Methodists, the hymnal was literally pocket-sized. It was intended to be carried on the person at all times, and precisely to function as a “playlist for life” for these Christians. They were like an analog, battery-less iPod. The early hymnals had no musical notations– just texts. They learned the tunes at class and society meetings, and were encouraged to sing daily, not just when they gathered for meetings at least twice weekly. Hymn singing was banned in the Church of England during Wesley’s lifetime, so these early Methodists weren’t singing these texts on Sunday morning (if they attended Anglican parishes, as most did). 2) I think the immersive/accompaniment ethos of music can easily go both ways. Your article (and Dan Wilt) seem to present immersive as more conducive to participation. John Wesley did not seem to think so. He did not allow organs in his chapels or society halls (perhaps to the slight chagin of brother Charles, an organist! ), and only grudgingly permitted a flute or a basic keyboard from time to time. For him, these were clearly about accompaniment, and the prime purpose was to make sure the human voices were heard and hearable loud and clear. The immersion was to emerge from the symphony of our fleshly instruments. Let me suggest also that Dan Wilt’s talk about sound being too soft from the stage is more an artifact of poor sound mixing and room acoustics that fight good singing than a primary concern for participation per se. These factors are are more prominent the larger the space and the more “acoustically untuned” it is. Dan’s article also seems to presume “large venue worship” as the basic norm– and, of course, for the vast majority of United Methodist congregations in the US at least, that’s not a very good assumption. If I look at medieval Roman Catholic worship, I’d call that very immersive visually, and even aurally, but not in terms of congregational singing. Indeed, the dramatic paintings, statuary, stained glass, and choral music TUNED and TIMED to the spaces were all designed to create as fully immersive a worship experience as the liturgy could allow given that it was required to be performed in Latin everywhere on the planet. (For an example of a TUNED/TIMED worship space and music, check out Gabrielli’s pieces designed for the very long reverb in St Mark’s in Venice). 3) As Eric has pointed out, your characterization of “contemporary” or “modern” worship as 250,000 songs nobody knows is a bit of hyperbole. Does that happen? Yes. Is it a problem where it does? Yes. And this is widely acknowledged within the “contemporary/modern” worship leader scene as a problem to be avoided. Even if it’s really cool and seems to be associated with increasing worship ATTENDANCE (if not participation) for a while. Any analysis of the CCLI Top 25 shows that list is actually pretty stable over time. It takes a lot of downloads (which presumably means a lot of usage every month) to break into the Top 25, and sustained usage to stay there. So in fact, in a lot of “CCLI-worship” venues (to avoid the term “contemporary”) there generally is also a basic canon of songs everyone knows. It’s just that canon can be different really now from place to place, and sometimes even from service to service within a congregation offering multiple services using different sourcing for the music it offers in worship. 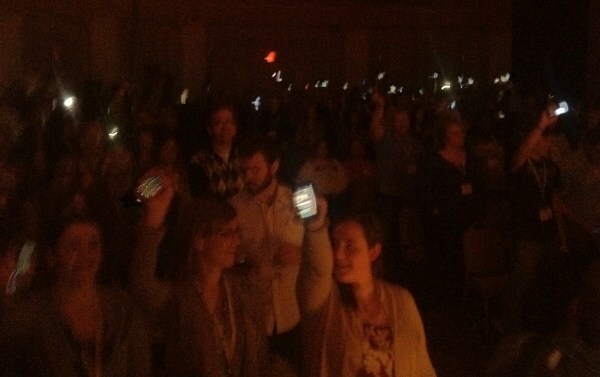 What does a picture of immersive music/hymnody look like to you using smartphone and other technology? Is there a difference to you between immersive and participatory worship? Great article Rev. Smith! I’d love to have a conversation about how to disrupt (sorry I hate the term but most people understand it) church not only worship. It needs to happen. And a slick app isn’t going to do it. But I’m sure it can be done. Are pastors best as Instigators, Editors, or Publishers?